We have talked getting a juicer for a long time now but decided to hold off until this summer when our farmer’s market was open and we could get our hands on the most affordable and biggest selection of produce. 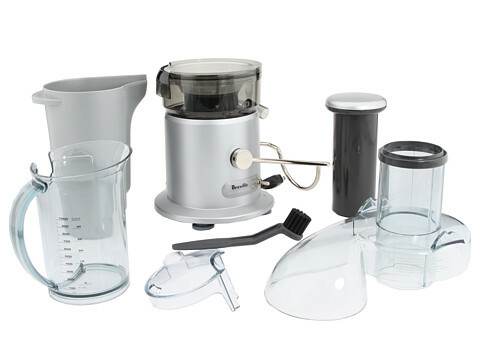 Last weekend we ended up biting the bullet and getting the Breville Juice Fountain Plus (find it HERE) and I wanted to share our thoughts with all of you. 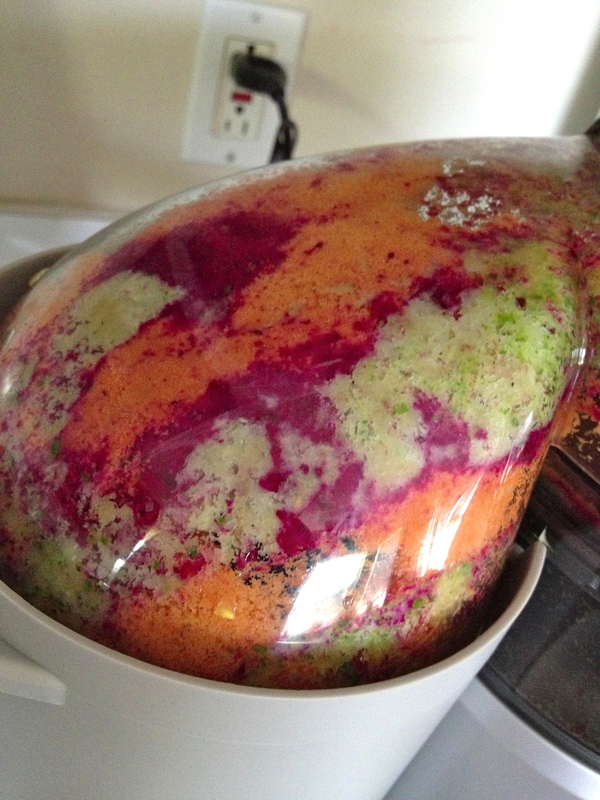 I also want to see what juicers you have and enjoy as well as get some of your favorite juice recipes! Let me start off by saying that our intention was not to do a juice cleanse and only juice. I had watched “Fat, Sick and Nearly Dead” (watch the whole thing for free HERE or if you have Netflix, it’s on there too) and my mother-in-law was juicing at the time and enjoying it so I just wanted to try it. I wanted to replace one meal a day with a juice to get more nutrients and just be a little more healthy. This past week I ended up juicing for breakfast and lunch instead and it worked for me so for right now that’s what I’m doing. All in all I absolutely love this juicer… I think it works well, it’s easy to clean and it’s not too big so I can keep it out on our counter! Basically the pros are: it’s easy to use, it juices really well and retains a good amount of the nutrients, it’s small enough to keep out on your counter and it’s easy to clean. The cons are: the pulp is smelly and seems like a waste, but if you follow my tips from the previous paragraph you can easily solve those two problems! 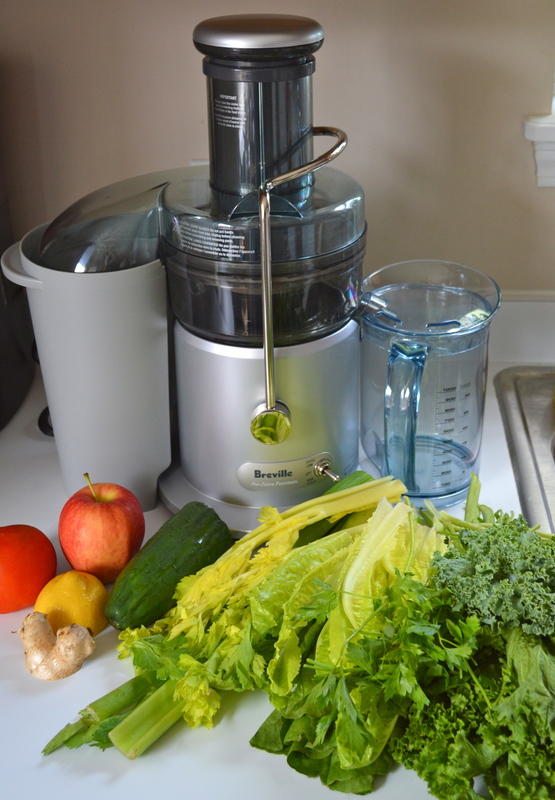 Basically I would definitely recommend this juicer and it gets my stamp of approval! So far I have three favorite juices. Juice 1 = 1/2 cucumber, 3 kale leaves, 2 romaine leaves, few sprigs of parsley, piece of ginger, a peeled lime, 2 celery stalks and an apple. 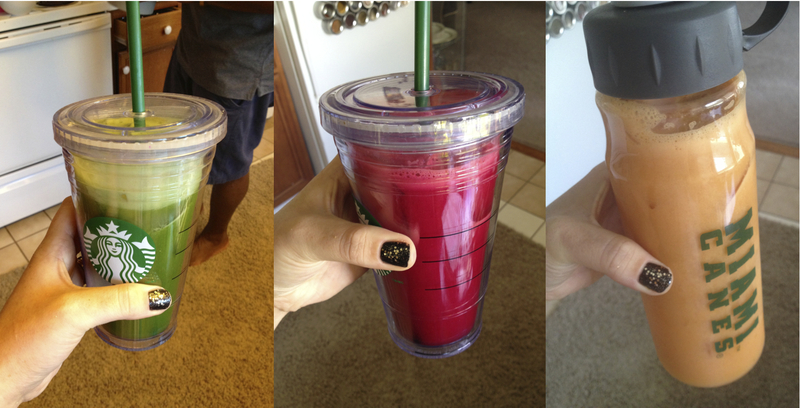 Juice 2 = 1 beet, 2 carrots, a peeled lemon, a granny smith apple and 1/2 a peeled orange. Juice 3 = 1 peeled grapefruit, a pear, 1 carrot, 1/2 peeled orange and a piece of ginger. What juicers do you guys have and recommend? Also, share some of your favorite juices with me! I use the pulp for compost in my garden! Another fantastic idea! I wish we had one that we could use it for! I have the exact same juicer. Yep, saw the movie, too. My issue is with juicing green leafy vegetables like lettuce, kale, and spinach. There is barely any juice extracted. So much greens juiced but so little return. Any tips for this? Thanks!!! I know what you mean, those veggies especially produce so little juice! That’s why I do the cucumber or the apples or celery because they’re so much water in those it pulls the leftover out of the juicer bowl and gives you as much as possible! I’m very new to juicing, do you peel the cucumber and take the seeds out of apples? Nope leave them on! The cucumber peel has lots of nutrients and your juicer will take out the seeds for you!